Classes just started again. Oh joy. There’s nothing exciting about sitting in a classroom for a few hours everyday, especially when most of the material being taught is already outdated. Today, instead of counting ceiling tiles, I began to think how lean startup techniques could be applied to a traditional classroom setting. Granted, education is an industry that is extremely resistant to change, but there are ways that teachers can incorporate some of these principals with little resistance from school administration. Typically, a professor will lecture for a few weeks, which is then followed by an exam. After grading the exams, the professor is then able to see how well the students performed. If the majority of students performed poorly, the professor is to largely to blame. 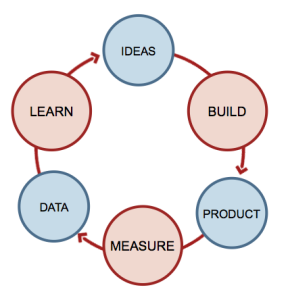 In the lean startup, it’s extremely important to have a continuous feedback loop. This is called the Build-Measure-Learn loop, and it’s illustrated below. In education, a professor will **build **a curriculum for the class. Over the course of the semester, he/she will seek to **measure **progress by assigning homework, tests, and projects. At the end of the course, the professor will **learn **if the curriculum/teaching worked or not. How can teachers quickly learn and adapt their curriculum to serve students better? I’ve only used a clicker for a few lecture classes. 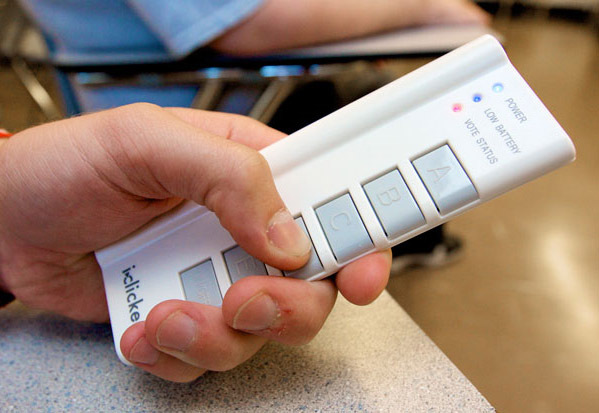 For those of you who are unfamiliar with how a clicker works, it’s very simple. The teacher asks questions, and the students respond with the device. The teacher is then able to see how the students answered. Every professor that I had who used the clicker typically asked questions at the end of the class. This works and provides valuable feedback, yet professors can speed up their learning by using this system multiple times during class. Professors present many different concepts throughout a one-hour class, so it’s critical to “chunk” the class into multiple sections (or learning topics). This accelerates the feedback loop exponentially, enabling the professor to pivot many times throughout the class! Education is centered around the final grade. If a student receives an “A”, education would deem that the student has “learned” what is necessary for the class. I find it fascinating how certain students struggle throughout the whole class, while others have no trouble at all. Students shouldn’t be as worried about the final grade, and instead focus on how much they learn throughout the duration of the course (validated learning). In the real world, this concept plagues many businesses. Generating income ASAP is the main priority, even if it means sacrificing long term financial success. Likewise, I think professors are focused on a student’s short-term performance, instead of long-term success. I think the minimum viable product (MVP) of education is still uncharted territory. Startups are trying to tap into this multi-billion dollar behemoth, yet resistance is strong, and the system is hesitant to change. In my opinion, the success of these startups will be determined by how quickly companies can** tailor education on an individual basis**. What are your thoughts? How can teachers use Lean Startup principles to serve students? I'm a Mainer in technology who likes growing internet companies and sharing stories about what I learn along the way. Also reading, soccer, and experimenting.